A mile of delightful open country lane with three clusters of cottages, several fine examples of old farm houses and a few middle 20th century detached houses. Approach from Bollington Road or Oak Lane, Kerridge. Leading to Ball Lane (part). 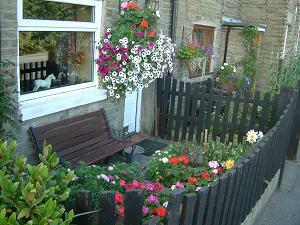 Nearest shops – Tytherington, Macclesfield, Bollington. Nearest pub – The Lord Clyde is in Clarke Lane. Both the Macclesfield Canal and the Middlewood Way are crossed by Clarke Lane. Kerridge Cricket Club have their ground along here. 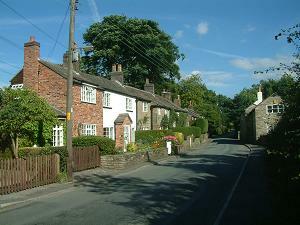 Mode Hill is the name given to the section of Clarke Lane around the row of cottages (left) and houses that includes the Lord Clyde pub. 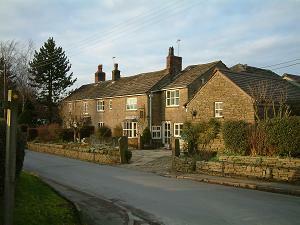 One of the oldest properties in the district is Mode Hill Farm. The distinguished physicist Sir James Chadwick (1891-1974) was born in one of the cottages in Clarke Lane. One of the delightful country houses along Clarke Lane. 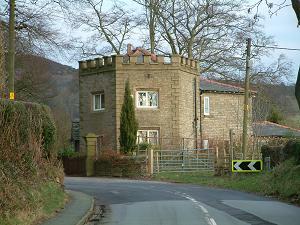 Endon Lodge, Grade II listed, a lovely octagonal gate house on the corner of Clarke Lane and Oak Lane. The driveway to the left of the house is the original front drive to Endon Hall. Briar Cottage, 4 Clarke Lane ; II, Formerly two cottages, now a house: dated 1630 on the deeds. Endon Lodge, Clarke Lane ; II, Formerly a lodge now a house, built c.1850. Not publicly accessible.